KayKiSpeaks.com: Bruce Jenner Photo'd hugged up on another woman in London! 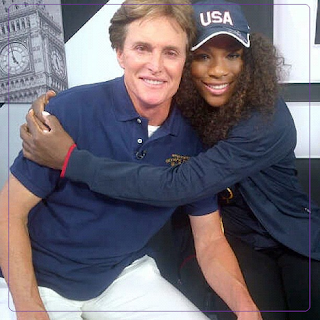 Bruce Jenner Photo'd hugged up on another woman in London! Get your minds out of the gutter.. Im sure Bruce is still a Kardashian. The Olympic Champion is in London for this years Olympics. While there he ran into a good friend of the family, Serena Williams. Serena had a huge weekend becoming only the second woman to achieve a Golden Slam in the Olympics.. with a HUGE victory over Maria Sharapova. I'm sure Bruce Jenner was very proud of her! Serena sent this photo to Kim and it made her all mushy. It's so cute! GO Serena!! !